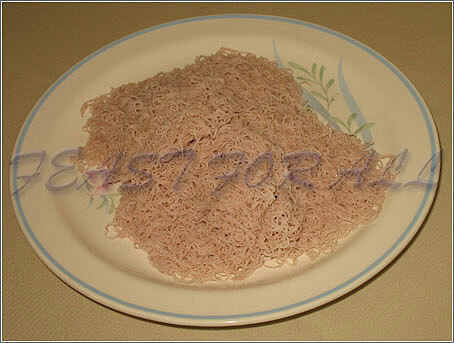 Idiyappam is normally consumed for break-fast and dinner. In Jaffna (Sri Lanka) idiyappam is made from combining red rice flour and wheat flour which gives the pinkish-brown color to the idiyappam. I use white rice flour instead of wheat flour. Wheat flour tend to stick to the idiyappam making mould and makes it difficult to squeeze the idiyappam. Traditionally idiyappam is served with sothi, coconut sambal, curries, or gravy. Roasting the rice flour gives the idiyappam a nice roasted smell. Put these trays on a steamer and steam for about 10 minutes. This site has great recipes. Thanks!!! it smells and tastes like matured beet root taste and smell, that earthy soil smell and taste…. Is CHEMBA suppose to be this way? I didn’t dry roast it should it be dry roasted? The bag doesn’t say roasted but the bag’s instructions don’t tell to roast it either. Or maybe the flour is old and when it gets old becomes this way or maybe there is a preservative in it? Yeh, some rice flour has earthy smell. You have to check the package. If the directions did not say anything about roasting, then most probably you dont have to roast. But there is no harm in roating it again, it won’t spoil the texture. Did you check the expiration date? Also which dals unpolished and polished we can eat along with this? I assume avoid Tamarind gravy and go for Sothi type coconut milk base. I think some eat eggplant curry with this….Try to find the right combination for a well rounded meal, please suggest accompaniments.